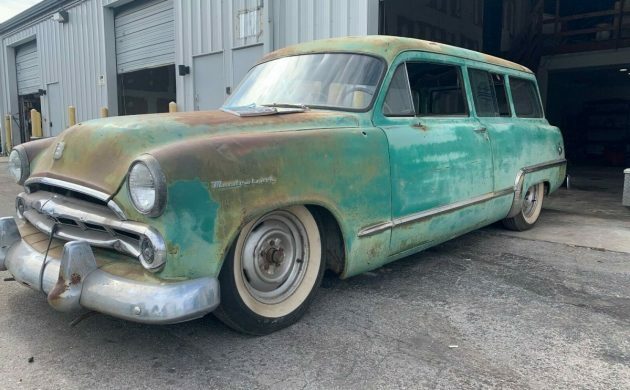 Prefer all of the space and good looks of a classic wagon but want it in a rat rod two-door version? Well this ’53 Dodge Meadowbrook/Suburban is a neat looking original that appears to be stock other than being lowered. Apparently a runner, but not quite a driver, this wagon has a great appearance that so many try to mimic. Bidding has come up to $2,125 with several days remaining in the auction. Check out this sweet wagon here on eBay out of Sarasota, Florida. 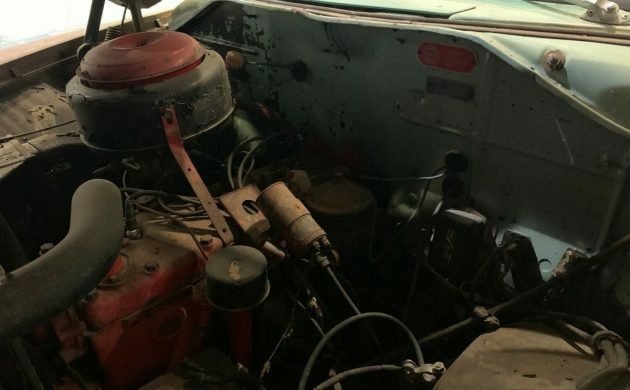 The stock flathead 6 cylinder is in place, and the seller claims that the engine ran when he purchased the car. Appearing complete and mechanically stable, the flat head could likely be spruced up into a slow cruiser engine. Or if you want to make this wagon more of a rat, perhaps a more modern V8 drive-train would breathe some new life into this Dodge. 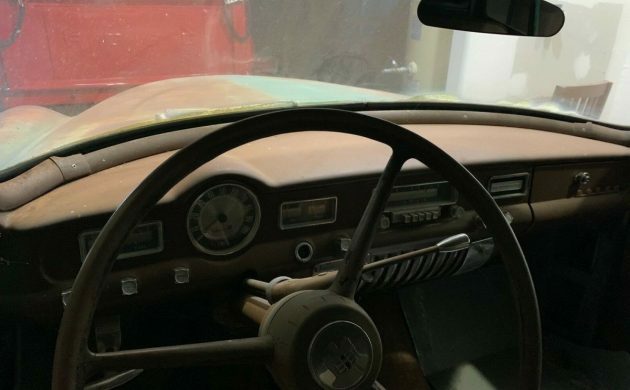 Simple but with nice details, the interior could stand to be cleaned up and undergo some upholstery work. A small detail that I really like is the herringbone pattern on the speedometer. All of the dash bright work is nice, and the dash itself doesn’t appear too shabby, other than being dusty and showing a matte finish. If you look closely you will see a new floor panel sitting on the passenger side floor. Miraculously the exterior appears rock solid, but the floors are in need of work. 4 new floor panels are included with this wagon, but the current condition of the floors is unknown. The paintwork on this Dodge is like that of a modern artist. All of the glass in place, as is the brightwork. Add some hubcaps, airbags, and a V8 swap and this wagon would be a sweet cruiser for sure. 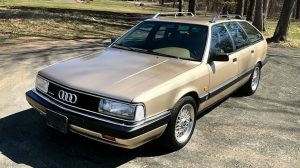 What would you do with this cool 2 door station wagon? Put that sweet little unit back just like it was born. Then enjoy it for the next 20 years. This doesn’t look anything like the definition of a rat rod, well, maybe except the bungee on the front bumper. My wife’s short. She’d love the dropped stance and the dual tail gates for shopping…. Clean it up a bit and run it. Love the look of a 53 ply. I’d drop a 340 4 speed in and have aa cool cruiser. Good luck to the new owner!! Why are you so hung up on creating a “rat rod”. Its an unusual car and should be restored as such, not butchered by some clown who thinks he knows better. This thing is just really cool. 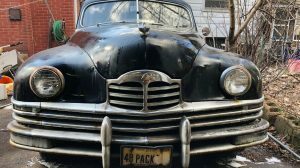 I’d make it roadworthy keeping the drive train as original as possible, clean and detail the engine compartment first, then focus on repairing and refinishing the bright work and find some appropriate dog dish hubcaps. I would not touch the paint but maybe have some paintless dent removal work done. Then I’d go after the interior keeping it stock. After a few years of this, I’d most likely crave the sound of a V8 so I’d install a modern Hemi if one could be found from a boneyard, and transform the entire drivetrain with a modern 6 speed manual transmission and 9″ rear. AC and disc brakes would be next…..and the dream continues…. Warmed up slant, 5 spd. Drive it! John Schiessl I am with you. This thing is just too cool for words! Amazing what a lowered stance does for the look. Ruined. 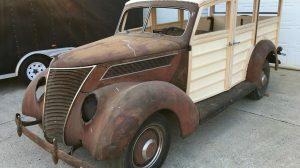 It will take another rat-rod enthusiast to buy this given its condition. If the springs were cut, there’s no going back to stock without new ones. Seems the inside of the tailgate shows it’s original turquoise shade; nice. 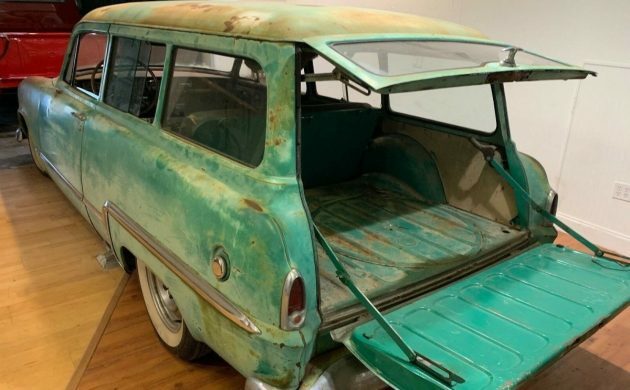 During the KT Keller years at Chrysler, they cut corners by using the `53 Plymouth wagon body for the Dodge from the cowl back. Thankfully Virgil Exner changed all that in `55 when all-new styling appeared across the board. 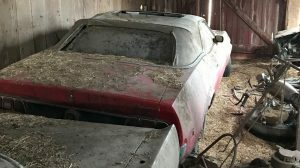 I will never understand why someone would restore a car they want to drive. Is this the same car from OKC from a month or so back – just sanded down a little – still a non-runner. Not sure what OKC is? You might have confused the car… first daylight that wagon has seen in almost a year was for the photos. Before that it sat in a metal building.